What's the point of that though? It's not like they even HINTED anything about this Jargl coming to the game at all. Also, I have no doubt you got the Jargl idea from the concept list, didn't you? If you did get it from the concept list, you must know that those are just that, concepts. They are just ideas that might come in a future update, but there is no guarantee that they actually will. I suggest that do try to not speculate about cars from that list unless they've been confirmed by a dev that they will come in the future. I belive the Jargl DT825 is going to be Diesel Turbo 82hp 5.0l. A diesel Swedish midsized family sedan is awesome. I'm dying to see that as the next vehicle. I doubt that. Here's why. 1. Jargl was established to be a Swedish company. Wentward is American. 2. The DT40L is not based on any Swedish bus, but rather American and Canadian buses. 3. 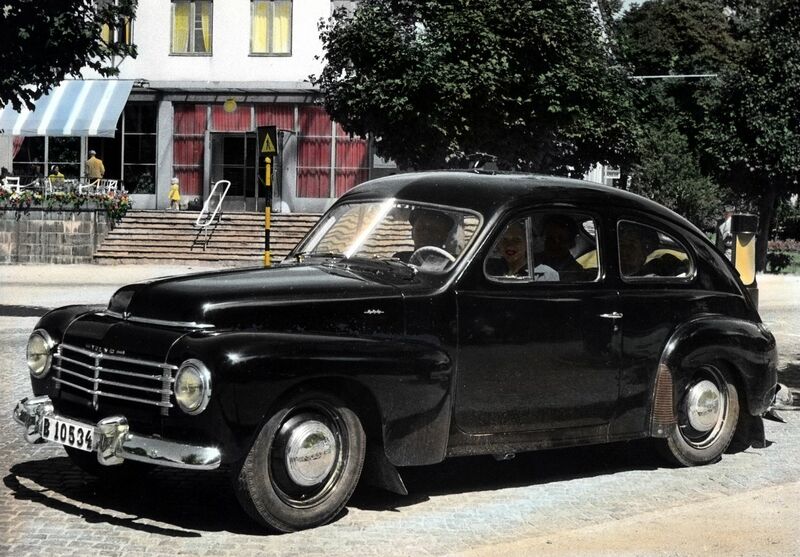 There is an old Volvo with a very similar name, the PV444/544. I believe that most likely the Jargl DT825 probably would've been based on the Volvo PV444/544. Is this from the concept list? Nothing else is going to happen until after the Bluebuck and Wendover are released. Besides, as awesome as a 240 clone would be, it's too fundamentally similar to the I series (e28-e30 based). Volvo's only V6 was the PRV engine, developed jointly by Peugot, Renault and Volvo. It made roughly 130 hp without a turbocharger or other modifications, and ran on gasoline. Notably, a variant of this engine found its way into the DeLorean via Renault. What engine, (or at the very least, what car) are you thinking of? The PRV V6 actually made more power (170, According to the 100 pound car challenge in TGUK) in Europe due to looser emissions regulations. The one in the DeLorean did indeed make 130 hp and I believe a 77 or 78 244 wagon made 120-125 hp. What i would think is that after the release of the German ETK test centre and the Italy map, we might have a chance of seeing more European based vehicles in Beam, in the start years, everything used to be US based, for the maps of course, things like East Coast USA and Small Island, USA, et cet. Looking at vehicles, we had things like the Gavril D-series, which were ultimately US based. Last years we got more European styled vehicles like the new Autobello Piccollina, and the ETK vehicles. Sure, theres been a mix with things like the LeGran, which were purely US vehicles, but i think we can expect some more European based vehicles, because there are still more US styled vehicles then that there are European. Just what i expect is gonna happen, if you think something else, be happy to post. If we’re going to see new european vehicles in the game, I probably think it’s going to be along the lines of a late 60s Mercedes 280se, not a Swedish box with 13hp/liter. Speaking of Volvos and their natural habitat I was thinking what map can be added next. Although I dont know if there will be any new maps at all considering how long they take to develop. But if there were any possibility of this then what map can it be ? We still not have any official winter-themed map with snow and ice. So it would cool to have some kind of Scandinavian-based map. Or maybe even Russian or Canadian. Regarding vehicles some modern SUV (some kind of Range Rover, Volvo XC90, Nissan X-Trail and Ford Explorer mix) or European cab-over truck could've fit in pretty well. Nothing else is going to happen until after the Bluebuck and Wendover are released. I have a feeling there’s going to be something in between the Bluebuck and Wendover. I doubt they would release 2 cars from the original list back to back, especially since the Wendover is a rather boring vehicle. To me this game won’t feel finished without an Asian map, and I really hope for a full winter map. According to the man himself, work resumed on the Bluebuck back in August. It's not clear whether Gabe personally or someone he's managing is responsible for the work. I really hope for a full winter map. I've wanted a winter map too, and with the new mud enhancements, it kinda like slush/snow possible. I'm definitely hoping for a winter-map with various conditions like black-ice, slush, powdered snow, etc. And I'd also like it to be some Scandinavian/Russian based map since we're on this Euro theme right now. But we already got three German vehicles. BeamNG currently lacks Swedish cars, so I'd rather see a Swedish car first and then the new German car later. I think a Jargl based on the Volvo 200 Series would be really cool. I'm positive it would really add a lot to BeamNG. A coupe, a sedan, a station wagon, some motorsport configurations, and like the Moonhawk and Piccolina (the Piccolina especially), different facelifts, since it had a production run from the 70's to the 90's, and looking through 240 pictures, I see a lot of different front ends. Also, I hear it a lot that Volvos are pretty much indestructible, so it would be very fun crashing a Jargl 240 around. After the release of the Italy map, i would love to see a Fiat Punto kind of thing, 1. Because Beam does not have a ''normal'' production car from Italy yet, 2. Because the Italy map just is released so realistic Italian vehicles will be cool to see. 3. Fiat also makes Southern American market vehicles, so the devs of BeamNG can start to make stuff for Southern America like a Brazil map, so Beam will get even more diverse then that it is right now. Mawbey weird thinking of me, but thats what i would hope. A Volvo would be also cool though, yeah, hope thats gonna be added soon. DT825 - Diesel, Turbo, 800-Series, 2.5. More like the old 200-/700-/900-Series/850. Not so hyped for that, given that we already have an 80s/90s RWD Euro exec (I-Series) and a slightly sporty, over-engineered 80s/90s FWD family car (Pessima), and we have tons of cars from that era already. But again, we don't have anything from Sweden. The I-Series is German, and the Pessima is Japanese. We don't have anything from France or Great Britain either, and both countries have very rich and significant automotive histories and traditions, possibly way more than Sweden. I'd also like them to focus on developing the existing brands already in game, instead of adding more, lacking proper depth. Why have something like what we already have just because it's from another country?